Ditch the telly, dump the valium. Let's unwind instead by pouring a hot bath and a large glass of wine, lighting some candles and listening to Hildegard of Bingen. Bach may be best for every occasion, but early music is great for late-night lullabies - confirming, in the words of the medieval Norwich mystic Julian, that all shall be well and all shall be well and all manner of things shall be well. But tonight water, wine and candles will have to wait - as will yet another airing of the 1995 CD Heavenly Revelations (Naxos 8.550998, a blissful £4.99 bargain). 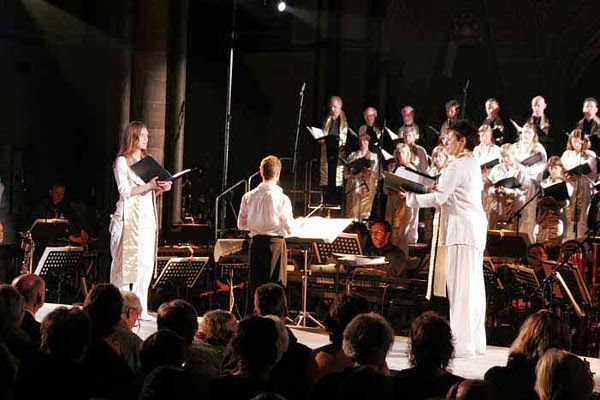 For singers and performers are staging a Hildegard tribute in the fitting setting of Norwich Cathedral. Unfortunately, what the impulsive EDP journalist failed to notice was that the performance was the premiere of James Wood's avant-garde opera Hildegard for soprano and baritone soloists, large ensemble, chorus and electronics - see production photo above. That rave preview resulted in a considerable number of people walking out during the two hour performance, but, unsurprisingly, I stayed the course and posted a favourable review. While writing this post nine years later I see that review is still quoted on the website of James Wood's publisher; but, sadly, the EDP preview is not.